We are one of the prominent manufacturers, exporters and suppliers of the Pulselith Pneumatic Lithotripter, pneumatic lithotripter and intracorporeal pneumatic lithotripter. This range is highly acclaimed among the users for its various features such as light weight, ergonomically designed, dual footswitch and compact. Our customer can avail this range from us at prescribed time at market leading prices. Being one of the leading manufacturers and suppliers of the Endourology Equipment and Medical Equipment, we offer Pneumatic Lithotripter and Intracorporeal Pneumatic Lithotripter to our elite clients. This product finds its application in the stones fragmentation for kidney stones and large bladder. Our range of pneumatic intracorporeal lithotripter is available with various features which are helpful in fragmentation like counter display, which shows number of pulses during fragmentation. It is easy to use as it is made from light weight stainless steel. All critical components used are imported. Complete digital model - microprocessor based. To and Fro excursion at the tip of the probes is less than 1mm. Pulse gives the user the choice of fragmenting the stone at his will. Counter to display the number of pulses used during the fragmentation of the stone. Compressed air supply: this can be achieved by the pulselith silent air compressor – and elctropneumatic device. it supplies a continuous flow of compressed air and is silent and delivers clean dry air. A cylinder having compressed air may also be used. the oxygen preset regulator would have to be connected to the cylinder and the out put of the cylinder would have to connect to the pulselith pneumatic lithotripter. An oxygen cylinder may also be used .the oxygen preset regulator would have to be connected to the cylinder and the out put of the cylinder would have to connect to the pulselith pneumatic lithotripter. Central oxygen system. 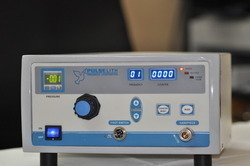 in hospitals and nursing homes the central oxygen supply system can be used to provide the required pressure for operating the pulselith pneumatic lithotripter. in this case the preset oxygen regulator would not be required. We introduce ourselves as an eminent manufacturer, supplier, exporter trader, importer of Pneumatic Our lithotripter machines are designed by our professionals using advance technology & best quality material as per the norms of market. These lithotripter machines are used through rigid or semi-rigid endoscope incorporating a straight working channel. The offered lithotripter machines are known among customers for their long life.